Mount Huangshan is located in Huangshan City, south of Anhui Province, China. It was designated an official World Heritage site by UNESCO in 1990. This mountain covers an area of 250 square kilometers with an area of 154 square kilometers of scenic attraction. The highest peak of the mountain is Lotus Peak which rises about 1,864 kilometers above sea level. The landscape of the mountain range features four wonders including imposing peaks, sea of clouds, spectacular rocks and odd-shaped pines. Mount Huangshan is also known as the Yellow Mountain because the area was renamed after the legendary Yellow Emperor, Huang Di in 747 AD. Before that, this mountain was known as Yishan or Mount Yi. The pines of the mountain are particularly hardy, seeming to twist directly out of the smooth rock. It was formed approximately 100 million years ago. It gained its unique rock formations in the Quaternary Glaciations. More than 300 different types of medicine herbs can be found here. There are a total of 72 peaks in this mountain range. The three tallest peaks are Celestial Capital Peak, Lotus Peak and Bright Top. There are two trails to hike which are the eastern steps and the western steps. The eastern steps trail is much easier as it has a foot path as compared to the western steps which has a rugged path. The average annual high temperature is 33°C and the average annual low temperature is -2°C. Declan, Tobin. " 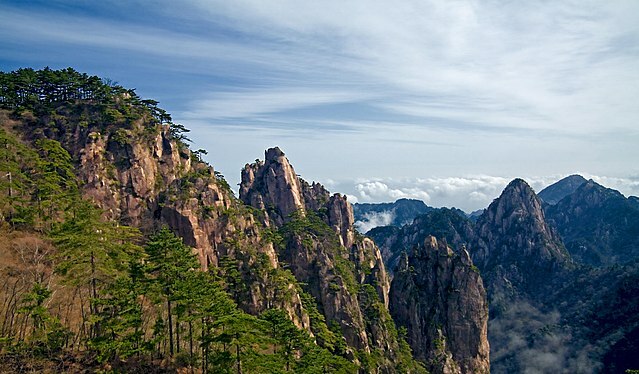 Mount Huangshan Facts for Kids ." Easy Science for Kids, Apr 2019. Web. 26 Apr 2019. < https://easyscienceforkids.com/huangshan-facts/ >.